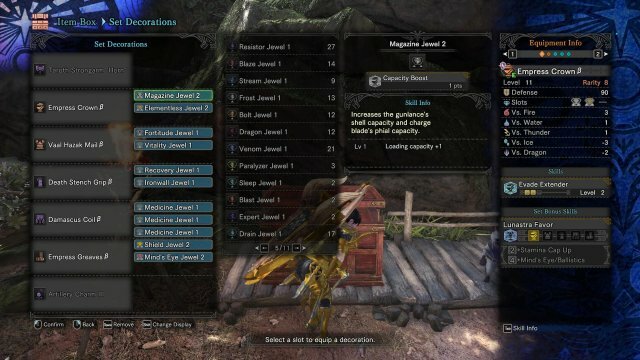 With this guide, I want to share my charge blade build that I've been using against all currently available monsters. I'm fully aware that there are already similar builds that utilize 'Super Amped Elemental Discharge' out there. However, most of them are offense oriented. This build will be focused on high survivability while still capable of dealing high burst damage. Note that this is a late game build and requires HR 30 or above to access weapon augments. This build is mostly suitable for hunters who, for any reason, don't have time to sheath weapon to heal, too stingy to use potions, or in my case, have an OCD to keep my potion inventory at maximum. 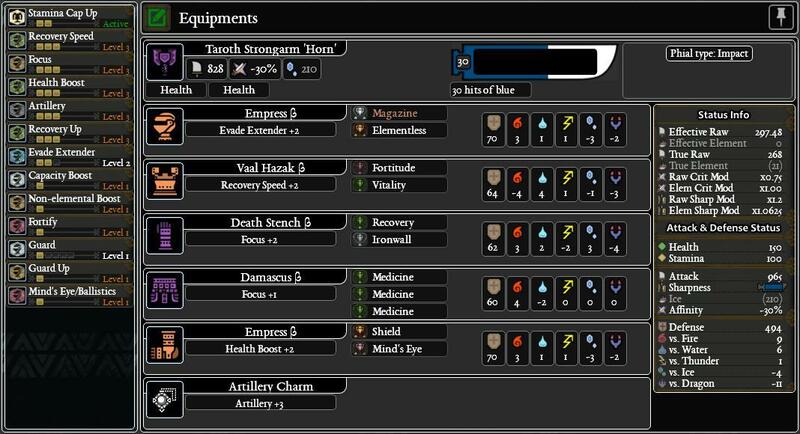 In other words, this build will help you tank damage as well as deal damage at the same time, while keeping item usage at minimum. Where to Find Kirin (Elder Dragon). How to Get the Sinister Cloth (Death Stench Armor Set). This build utilizes the popular Super Amped Elemental Discharge (SAED) due to its high damage and synergy with Health Regeneration augment. Hence, most of the offensive aspects of this build will be similar to those builds. 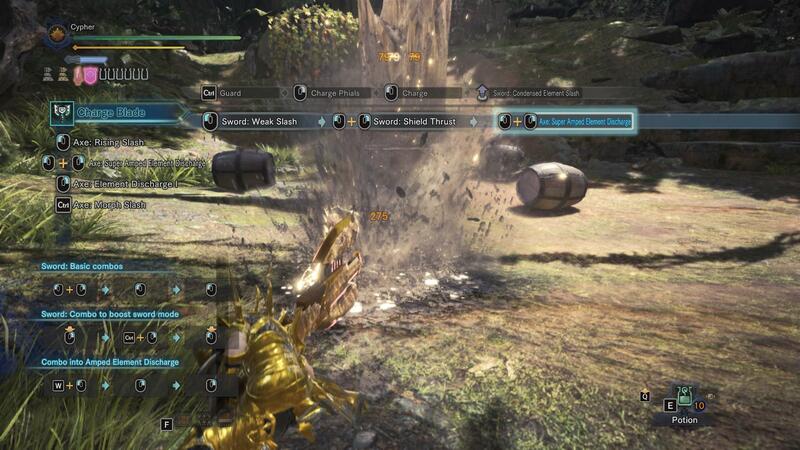 It works best with SAED build because the phial explosion deals blast damage (similar to bomb damage / blast proc) which is not affected by sharpness nor critical, and will always deals the same damage regardless of where it hits. And since we won't have to worry about sharpness nor critical skills, there will be more slots for other skills. 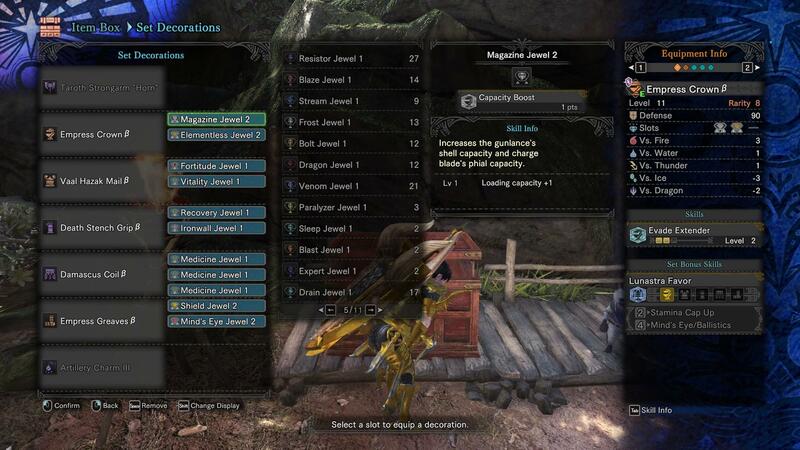 Most of the equipments and jewels in this build are not that rare, with the exception of Warrior Streamstone for augment and some special skill jewels like Mind's Eye and Guard Up, but are optional and can be replaced with other skill jewels. 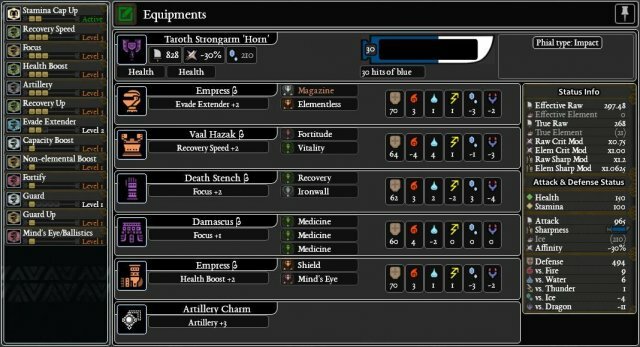 As alternative, you can replace Taroth Strongarm 'Horn' with Diablos Tyrannis II for similar stats except for lower defense bonus (+15 instead of +25). You can also replace Death Stench β grip to Kushala y grip for slightly different stats and an extra Lv. 1 decoration slot. Yes, the weapon has 2 Health Regeneration augments which will give roughly 15% damage to healing conversion. Since the other augments are kind of lackluster for this build. Most players use Health Regeneration + Attack augment in their build, but i find the additional 5 true raw damage from Attack augment won't do much. For example, SAED phial explosion will do 81 damage each with Attack augment, compared to 79 damage without it. Recovery Speed (Rank 3) - Quadruples regeneration speed of the red parts (orange if regeneration buff is applied) of health gauge. Combine with immunizer for octuple regeneration speed. Focus (Rank 3) - Speeds up phial gain and sword charge attack. With this skill, you'll only need 2 hits of regular attack and 2 hits of charged attack. A good way to get red phial is by using jumping forward slash > charged double slash > round slash, or rising slash > return slash > charged double slash. Health Boost (Rank 3) - Increases maximum health by 50 points. Stacks with food buffs for a total of 200 maximum health. Artilerry (Rank 3) - Increases phial explosion damage by 30%. Applies to all phial based damage (hits from the weapon does not count) such as Super Amped Elemental Discharge, Amped Elemental Discharge, Condensed Element Slash, and the extra damage from sword mode buff. Recovery Up (Rank 3) - Increases the amount of healing from all source by 30%. This applies to Health Regeneration augment. Evade Extender (Rank 2) - Increases evade distance. It might not seem much, but it can help to close distance without sheathing your weapon. It will also help to evade certain attacks, such as targeted Charybdis, which without it is not possible with your weapon drawn. Capacity Boost (Rank 1) - Adds 1 phial capacity for a total of 6 phials. 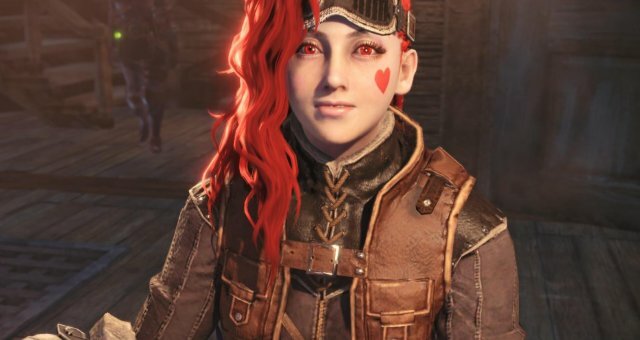 The additional phial will give extra explosion during SAED and sword / shield buff duration. This results in more damage and less downtime. Non Elemental Boost (Rank 1) - Increases raw damage for roughly 10%. Only works for weapons with no active element damage or status damage. This is a must for any raw damage builds. Fortify (Rank 1) - Increases Attack by 10% and Defense by 15% each time you get carted. Stacks up to 2 times for 20% Attack and 30% Defense bonus. This one is optional. If you're confident that you won't get carted, you can replace it with something else. Guard (Rank 1) - Slightly decreases knockback and stamina consumption when guarding attacks. This effect is further enhanced by buffing your shield (+1) and utilizing guard point (+1), which in total will give similar effect as Rank 3 Guard. This is important since you can only chain guard into SAED / AED if you receive small / medium knockback after guarding, and without it you will mostly get medium / high knockback when guarding attacks from large monsters. 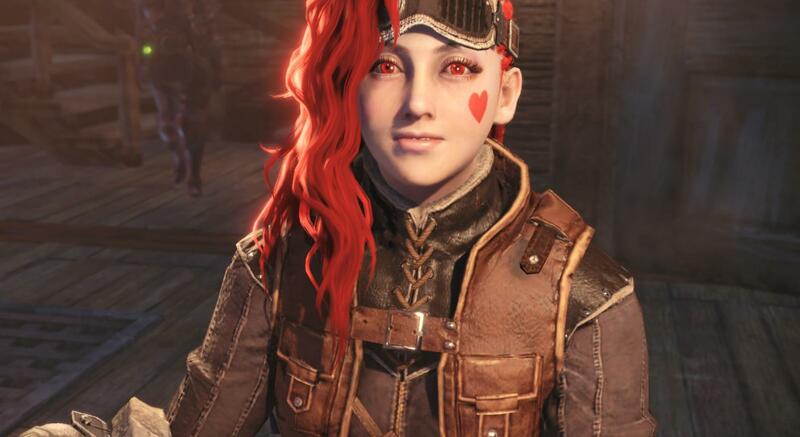 Mind's Eye / Ballistics (Rank 1) - Prevents weapon from bouncing when hitting certain parts of monster or when attacking with low sharpness. This one is optional since you can get similar effect from sword buff, and also because this jewel is quite rare. You'll need it when you're fighting thick armored monster such as Lavasioth or Kirin, since it will be hard to charge phial or buffing your sword if your attacks keep bouncing off. Guard Up (Rank 1) - Enables guarding against normally unblockable attacks such as Teostra's Supernova, Behemoth's Frontal Eruption, etc. This one is optional but is highly recommended since it might save your life a lot. Stamina Cap Up (Rank 1) - Set bonus from Empress Armor. Extends stamina cap to 200 points. Useful when you need to guard a lot, and keep on rolling. Felyne Medic - Increases the amount of healing from all sources even further. The exact percentage is unknown, but you'll notice the difference from this skill. Felyne Bombardier - Increases phial explosion damage even further for about 15% bonus. At a glance you might think that with mostly defensive oriented skills, the damage output might be low. But once you actually test it, you'll be surprised. The main advantage of this build is that you will have a high survivability due to increased maximum health and the ability to quickly recover lost health using Health Regeneration augment. Charge blade benefits greatly from Health Regeneration augment especially from using SAED and with this build you can heal yourself a lot, while also dealing damage. The disadvantage is that SAED is hard to use against small or fast enemies. Also, your regular sword attacks are weaker than usual due to -30% affinity, though in this build, sword attacks are mostly used to fill up phial rather than to do the majority of the damage. If needed, use AED instead when it's not possible to land SAED. This is done with no external buffs aside of charms and talons. Note that the axe slam for 275 damage (ignore the initial sweeping attack which does almost no damage) and the phial explosion for 79 damage each hits, with 474 total damage from 6 phials. If we use this as basis for the calculation, then we will get a total of 749 damage. Then we have Health Regeneration augment which will convert 15% + (15% x 130%) = 19.5% damage to healing. The result will be roughly 146 health recovery. Of course in actual application, the axe slam will rarely do that much damage since it will be affected by target resistances and negative affinity. Note that the axe hit only deals 90 damage when hitting Behemoth's hind leg, while phial explosion still deals 79 damage. But still, even If we count only on the phial explosions, which will always do fixed 79 damage, then we will have 474 damage and roughly 92 health recovery. And that's still excluding the bonus from Felyne Medic buff. This build will shine in a prolonged fight where you just can't get a break, since you won't have to worry about stopping to heal or resharpen your weapon. With caution you can regain lost health when attacking, you also won't have to worry about your weapon sharpness since most damage comes from phial explosion which is unaffected by sharpness level, and can still charge phial with your sword without getting bounced off since you have Mind's Eye. With Rocksteady Mantle, you can even trade hits with monsters and still rocking it, just keep your health points in check.